Lü, J.C., Chen R.J., Brusatte, S.L., Zhu, Y. X. and Shen C. Z. 2016. A Late Cretaceous diversification of Asian oviraptorid dinosaurs: evidence from a new species preserved in an unusual posture. Scientific Reports, 6:35780, DOI: 10.1038/srep35780. Lü J.C., Liu C.Y., Pan L.J., Shen C.Z. 2016. A new pterodactyloid pterosaur from the Early Cretaceous of western Liaoning, northeastern China. Acta Geologica Sinica 90(3):777-782. Lü J.C., Kobayashi Y., Deeming, D.C., Liu Y.Q. 2015. Post-natal parental care in a Cretaceous diapsid from northeastern China. Geosciences Journal 19: (2) 273-280. Lü J.C., Pu H.Y., Kobayashi Y., Xu L., Chang H.L., Shang Y.H., Liu D., Lee Y-N, Kundrát M. and Shen C.Z. 2015. A New Oviraptorid Dinosaur (Dinosauria: Oviraptorosauria) from the Late Cretaceous of Southern China and Its Paleobiogeographical Implications. Sci. Rep. 5, 11490; doi: 10.1038/srep11490. LÜ J.C., Pu H.Y., Xu L., Wei X.F., Chang H.L., and Kundrát M. 2015. A new rhamphorhynchid pterosaur (Pterosauria) from Jurassic deposits of Liaoning Province, China. Zootaxa, 3911 (1): 119–129. Lü, J. and Brusatte, S. L. 2015. A large, short-armed, winged dromaeosaurid (Dinosauria: Theropoda) from the Early Cretaceous of China and its implications for feather evolution. Sci. Rep. 5, 11775; doi: 10.1038/srep11775. Lü J.C., Yi L.P., Brusatte S.L., Yang L., Li H. and Chen L. 2014. A new clade of Asian Late Cretaceous long-snouted tyrannosaurids. Nature communications, DOI: 10.1038/ncomms4788.
. Lü, J.; Xu, L.; Pu, H.; Zhang, X.; Zhang, Y.; Jia, S.; Chang, H.; Zhang, J. et al. 2013. A new sauropod dinosaur (Dinosauria, Sauropoda) from the late Early Cretaceous of the Ruyang Basin (central China). Cretaceous Research 44, 202-213. Lü J.C., Currie P. J., Xu L., Zhang, X.L., Pu H.Y., Jia S.H. 2013. Chicken-sized oviraptorid dinosaurs from central China and their ontogenetic implications. Naturwissenschaften, 100(2): 165-175. Lü Junchang, Yi Laiping, Zhong Hui, Wei Xuefang. 2013. A new oviraptorosaur (Dinosauria: Oviraptorosauria) from the Late Cretaceous of Southern China and its paleoecological implications. PLoS ONE 8(11): e80557. doi:10.1371/journal.pone.0080557. Lü Junchang, Ji Qiang, Wei Xuefang, Liu Yongqing. 2012. A new ctenochasmatoid pterosaur from the Early Cretaceous Yixian Formation of western Liaoning, China. Cretaceous Research 34: 26-30. Lü, J.C., Unwin D. M., Deeming D. C., Jin, X.S., Liu, Y.Q., Ji Q. 2011. An Egg-Adult Association, Gender, and Reproduction in Pterosaurs. Science, 331:321-324. Lü J.C., Xu, L., Chang H.L. and Zhang X. L. 2011. A new darwinopterid pterosaur from the Middle Jurassic of western Liaoning, Northeastern China and its ecological implications. Acta Geologica Sinica, 85(3):507-514. Lü Junchang, Bo Xue. 2011. A new rhamphorhynchid pterosaur (Pterosauria) from the Middle Jurassic Tiaojishan Formation of western Liaoning, China. Acta Geologica Sinica, 85(5): 977-983. Lü Junchang, Xu Li, Jia Songhai, Li Jinhua, Yang Li, Hu Weiyong, and Ji Qiang. 2010. A new troodontid (Theropoda: Troodontidae) from late Cretaeous of Xixia, Henan Province. Acta Palaeontologica Polonica 55(3):381-388. Lü Junchang. 2010. A new boreopterid pterodactyloid pterosaur from the Early Cretaceous Yixian Formation of Liaoning Province, Northeastern China. Acta Geologica Sinica 84 (2):241–246. .Lü Junchang, Azuma Y., Dong Z. M.,Barsbold R.,Kobayashi Y., Lee N.-M. 2009. New material of dsungaripterid pterosaurs (Reptilia: Pterosauria) from western Mongolia and its paleoecological implications. Geol. Mag. 146 (5), 690–700. Lü Junchang, Xu L., Jiang X. J., Jia S.H., Li M., Yuan C.X., Zhang X. L. and Ji Q. 2009. 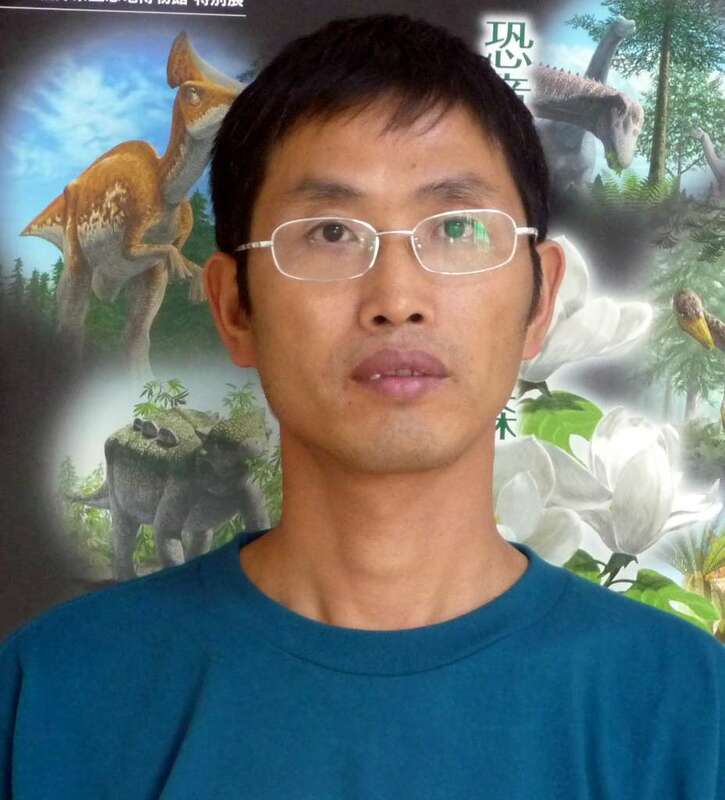 A preliminary report on the new dinosaurian fauna from the Cretaceous of the Ruyang Basin, Henan Province of central China. Journal of the Paleontological Society of Korea, 25(1):43-56. Lü J. C., Xu L., Jia S. H., Zhang X. L., Zhang J. M., Yang L. L., You H. L., Ji Q. 2009. A new gigantic sauropod dinosaur from the Cretaceous of Ruyang, Henan Province, China. Geological Bulletin of China，28(1):1-10. Lü Junchang. 2009. A new non-pterodactyloid pterosaur from Qinglong County, Hebei Province of China. Acta Geologica Sinica，83(2):189-199. Lü Junchang.2009. A baby pterodactyloid pterosaur from the Yixian Formation of Ningcheng, Inner Mongolia, China. Acta Geologica Sinica，83(1):1-8. Lü J. C., Unwin D. M., Xu L., Zhang X.L. 2008. A new azhdarchoid pterosaur from the Lower Cretaceous of China and its implications for pterosaur phylogeny and evolution. Naturwissenschaften，95：891-897. Lü, J.C., Ji Shu-an, Dong Z.M., & Wu X. C. 2008. An Upper Cretaceous lizard with a lower temporal arcade. Naturwissenschaften, 95: 663-669. Lü Junchang, Yoichi Azuma, Chen Rongjun, Zheng Wenjie, Jin Xingsheng. 2008. A New Titanosauriform Sauropod from the early Late Cretaceous of Dongyang, Zhejiang Province. Acta Geologica Sinica, 82(2): 225-235. Lü Junchang, Li Tianguang, Zhong Shimin, Ji Qiang and Li Shaoxue. 2008. New mamenchisaurid dinosaur from the Middle Jurassic of Yuanmou, Yunnan Province. Acta Geologica Sinica, 82(1):17-26. Lü Junchang, Ji Qiang, GAO Yubo, Li Zhixin. 2007. A new species of the ankylosaurid dinosaur Crichtonsaurus (Ankylosauridae: Ankylosauria) from the Cretaceous of Liaoning Province. Acta Geologica Sinica, 81(6): 883-897. Lü Junchang, Gao Yubo, Xing Lida, Li Zhixin and Ji Qiang. 2007. A new species of Huaxiapterus (Pterosauria: Tapejaridae) from the Early Cretaceous of western Liaoning. Acta Geologica Sinica, 81(5): 683-687. Lü, Junchang,Kobayashi Y., Lee, Y. N.
Lü Junchang, Xu Li, Zhang Xingliao, Hu Weiyong, Wu Yanhua, Jia Songhai and Ji Qiang. 2007. A New Gigantic Sauropod Dinosaur with the Deepest Known Body Cavity from the Cretaceous of Asia. Acta Geologica Sinica, 81(2):167-176. Lü Junchang, Jin Xingsheng, Sheng Yiming, Li Yihong, Wang Guoping and Yoichi AZUMA. 2007. New Nodosaurid Dinosaur from the Late Cretaceous of Lishui, Zhejiang Province, China. Acta Geologica Sinica, 81(3):344-350. Lü Junchang, Xu Li, Zhang Xingliao, Ji Qiang, Jia Songhai, Hu Weiyong, Zhang Jiming and Wu Yanhua. 2007. New dromaesoaurid dinosaur from the Late Cretaceous Qiupa Formation of Luanchuan area, western Henan, China. Geological Bulletin of China, 26 (7): 777-786. Lü Junchang, LI Tianguang, ZHONG Shimin, AZUMA Yoichi, FUJITA Masato, DONG Zhiming and JI Qiang .2007. New yunnanosaurid dinosaur (Dinosauria, Prosauropoda) from the Middle Jurassic Zhanghe Formation of Yuanmou, Yunnan Province of China. Memoir of the Fukui Prefectural Dinosaur Museum 6：1―15. Lü Junchang, Yoichi Azuma, Huang Dong, Noda Yoshikazu and Licheng Qiu. 2006. New troodontid dinosaur eggs from the Heyuan Basin of Guangdong Province, southern China. P11-18. In Lü, J.C., Kobayashi Y., Huang D., and Lee Y.-N. (eds.). Papers from the 2005 Heyuan International Dinosaur Symposium. Geological Publishing House, Beijing. Lü, Junchang, AZUMA Y., Wang, T., Li, S.X. and Pan, S.G. 2006. The first discovery of dinosaur footprint from Lufeng of Yunnan Province, China. Memoir of the Fukui Prefectural Dinosaur Museum 5:35-39. Lü Junchang，Gao Chunling，Meng Qingjin，Liu Jinyuan，Ji Qiang. 2006. On the systematic position of Eosipterus yangi Ji et Ji, 1997 among Pterodactyloids. Acta Geologica Sinica, 80(5):643-646. Lü Junchang and Ji Qiang. 2006. Preliminary results of a phylogenetic analysis of the pterosaurs from western Liaoning and surrounding areas. Journal of the Paleontological Society of Korea 22(1):239-261. Lü Junchang, Gao Chunling, Liu Jinyuan, Meng Qingjin, Ji Qiang. 2006. New material of the pterosaur Eopteranodon from the Early Cretaceous Yixian Formation, western Liaoning, China. Geological Bulletin of China, 25(5): 565-571. Lü Junchang, Jin Xingsheng, Unwin David M, Zhao Lijun, Azuma Yoichi, Ji Qiang. 2006. A new species of Huaxiapterus (Pterosauria: Pterodactyloidea) from the Lower Cretaceous of western Liaoning, China with comments on the systematics of tapejarid pterosaurs. Acta Geologica Sinica, 80(3): 315-326. Lü Junchang, Li Shaoxue, Ji Qiang, Wang Guofu, Dong Zhiming. 2006. New eusauropod dinosaur from Yuanmou of Yunnan Province. Acta Geologica Sinica, 80(1):1－10. Lü Junchang, Kobayashi Yoshitsugu, Yuan Chongxi , Ji Shu-an, Ji Qiang. 2005. SEM observation of the wing membrane of Beipiaopterus Chenianus (Pterosauria). Acta Geologica Sinica, 79(6): 766-769.
. Lü Junchang and Ji Qiang.2005. New azhdarchid pterosaur the Early Cretaceous of western Liaoning. Acta Geologica Sinica, 79(3): 301-307. 吕君昌.2005.中国南方窃蛋龙类化石。北京:地质出版社Pp208（专著）。[Oviraptorid dinosaurs from southern China. Geological Publishing House, Beijing. 208pp (Monograph)]. Lü Junchang and Ji Qiang.2005. A new ornithocheirid from the Early Cretaceous of Liaoning Province, China. Acta Geologica Sinica, 79(2): 157–163. Lü Junchang and Hou Lianhai. 2005. A possible long-tailed bird with a pygostyle from the Late Mesozoic Yixian Formation, Western Liaoning, China. Acta Geologica Sinica, 79 (1): 7-10. Lü Junchang, Tomida, Y., Azuma,Y., Dong, Z.-M., and Lee, Y.-N. 2004. New oviraptorid dinosaur (Dinosauria: Oviraptorosauria) from the Nemegt Formation of southwestern Mongolia. Bulletin of the National Science Museum, Tokyo, Ser. C, 30: 95-130. Lü, Junchang. 2003. A new oviraptorosaurid (Theropoda: Oviraptorosauria) from the Late Cretaceous of southern China. Journal of Vertebrate Paleontology 22(4):871-875. Lü Junchang, 2003. A new pterosaur: Beipiaopterus chenianus, gen. et sp. nov. (Reptilia: Pterosauria) from Western Liaoning Province of China. Memoir of the Fukui Prefectural Dinosaur Museum 2: 153-160. Lü, Junchang, Dong, Z. M., Azuma, Y., Barsbold, R. and Tomida, Y. 2002. Oviraptorosaurs compared to birds; In Proceedings of the 5th Symposium of the Society of Avian Paleontology and Evolution. Eds. Zhou, Z. and Zhang, F. (Science Press, Beijing China), 175-189. Lü, Junchang, Kobayashi, Y. and Li. Z-G. 1999. A new species of Ikechosaurus (Reptilia: Choristodera) from the Jiufutang Formation (Early Cretaceous) of Chifeng City, Inner Mongolia. Bulletin de L’institut des Sciences Naturelles de Belgique. 69-supp. B: 37-47. Kobayashi, Y., Lü, Junchang, Dong, Z.-M., Barsbold, R., Azuma, Y., and Tomida, Y. 1999. Herbivorous diet in an ornithomimid dinosaur. Nature 402: 480-481. Lü, Junchang, Zhu, Q.-Zh., Cheng, X.-K., and Du, X.-K. 1999. Computed tomography(CT) of nasal cavity of Ikechosaurus sunailinae (Reptilia: Choristodera). Chinese Science Bulletin. 44(24): 2277-2281. Lü, Junchang. 1997. A new Iguanodontidae (Probactrosaurus mazongshanensis sp. Nov.) from Mazongshan Area, Gansu province, China. In Sino-Japanese Silk Road Dinosaur Expedition, Edit. Dong, Z-M. (China Ocean Press, Beijing), 27-46. Lü, Junchang, and Wu, X-C. 1996. Restudy of Shantungosuchus brachycephalus Young, 1982. Vertebrata PalAsiatica 34(3): 184-201.